Dr. Patrick Cieplak recently invested in the latest iTero® Element™ Intraoral Scanner, technology designed to capture highly accurate and precise digital impressions of the mouth for Invisalign® cases, among other services. The advanced system eliminates the need for messy impression materials, and reduces the time between various types of procedures and delivery of appliances, including partials, dentures and dental crowns, for La Plata, MD, patients. Dr. Patrick Cieplak announces his recent investment in the latest iTero® Element™ Intraoral Scanner, for use in his modern dental practice. The cutting-edge technology renders highly accurate and precise digital scans, eliminating the need to use messy materials when capturing impressions of the mouth. Focused on delivering the latest in advanced dentistry and techniques, Dr. Cieplak uses the intraoral scanner when planning Invisalign® orthodontic treatment and customizing restorations for a number of services, some of which include implant restorations, partials, dentures, and dental crowns. La Plata, Md. patients benefit from Dr. Cieplak’s use of his recent investment, as the technology increases treatment efficiency, reducing the time between a procedure and delivery of a permanent restoration. The iTero Element Intraoral Scanner uses CAD/CAM technology to capture digital impressions, or images, of the mouth, without the use of uncomfortable or messy traditional impression materials and trays. The scans are fast, highly accurate and produce data in greater detail, including 3-D images of the teeth, oral structures and the bite (the relationship between the upper and lower teeth). Dr. Cieplak is committed to bringing the latest in dental techniques and technologies to his those who require treatments like Invisalign and dental crowns in La Plata, Md. By using the latest iTero Element Intraoral Scanner, Dr. Cieplak enhances the patient experience for a number of procedures, including Invisalign orthodontics. The iTero Element is designed to work seamlessly with Invisalign technology, improving the fit of clear aligners and delivering a better overall experience for Invisalign patients. The system also affords the patient a simulated opportunity to see how their teeth will look following orthodontic treatment. Patients who require restorative treatment, such as dental implant restorations, partials, dentures and dental crowns, among other services, also benefit from iTero Element scanning technology. Digital impressions streamline the restorative process by decreasing the time between a procedure and delivery of final restoration. Patients report the digital impression process to be more comfortable and less stressful than traditional impression procedures. Those interested in learning more about Dr. Cieplak’s use of digital scanning technology for treatments such as Invisalign and dental crowns in La Plata, Md. are invited to call his office at 301-609-9999 to schedule an appointment, or visit his website at http://www.patcieplakdds.com. 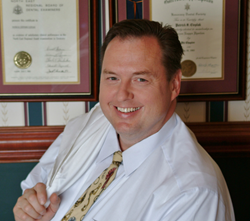 Dr. Patrick Cieplak is a general dentist offering personalized dental care to patients in La Plata, Md. Dr. Cieplak is dedicated to learning the latest dental techniques and has completed hundreds of hours of continuing education courses. Dr. Cieplak is one of only 3,000 dentists to receive the Academy of General Dentistry’s Master’s Degree and he is a Fellow in the International Congress of Oral Implantology as well as Associate Fellow in the American Academy of Implant Dentistry. Cieplak Dental Excellence strives to offer each patient customized treatment to help them achieve proper oral health. To learn more about Dr. Cieplak, his team or the services they offer, please visit http://www.patcieplakdds.com or call 301-609-9999 to schedule an appointment.